Alaa Yassin, advisor to the Egyptian minister of water resources and irrigation, told Ahram Online that a deadline for the consultancy firms to submit their reports to the committee would be announced following the meeting on Thursday. It is not clear why consultancy firms didn't deliver their reports to the committee on time. However, Yassin told Ahram Online that Sudan, which hosted the most recent talks in Khartoum, should have been the country initiating talks with the firms and questioning them over the delay. According to Yassin, the tripartite committee will comment on and raise their concerns about the technical report conducted by the two firms upon its delivery. The three countries previously agreed to give 70 percent of the research workload to the French consultancy firm, while the other 30 percent was given to the Dutch firm. "We are trying to do our best to reserve our rights over Nile water. We will not concede regarding our historical right," Yassin asserted. Yassin also told Ahram Online that Egypt is aware of the conflict of interests between the three countries regarding the dam, especially because each party has different objectives. Each of the three countries in the tripartite committee has the power of veto. 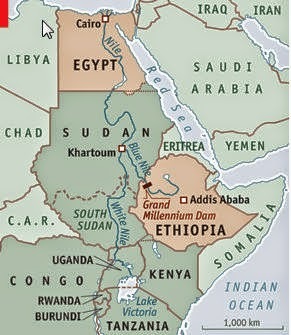 In March 2015, Egypt, Sudan and Ethiopia signed a declaration of principles on the dam, agreeing to safeguard the interests of all three countries. 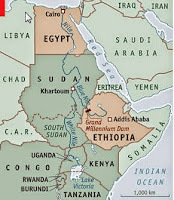 Egypt and Ethiopia have been witnessing an improvement in relations. Egypt's President Abdel-Fattah El-Sisi, who hailed the declaration as a "positive step", visited Ethiopia in March and addressed the country's parliament, calling for a new era of cooperation. A high-level Ethiopian delegation led by Ethiopian Prime Minister Hailemariam Desalegn attended the Suez Canal inauguration this month. "It's in the best interests of all if we reach a middle ground or even a certain compromise regarding the dam,'' Yassin said. According to the irrigation ministry, Egypt is currently suffering from a water deficit of 20 billion cubic meters and compensates it through water recycling, a process that isn't advisable in the long run.